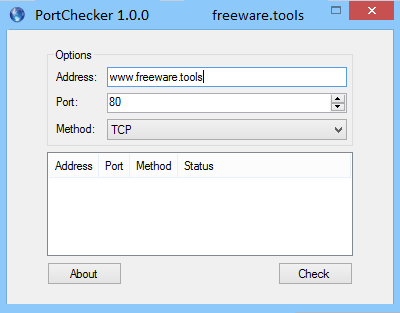 PortChecker is a very small and fast tool, brought to you by CodeDead, that you can use to check if a certain UDP or TCP (or both) port is open or not. Both IP addresses and domain names can be entered. Generally speaking, if you are experiencing connection issues when you attempt to access an online game, application or service, then one potential culprit can be port exhaustion or perhaps they are closed. PortChecker is a tiny utility that is developed to help you check whether certain TCP or UDP ports are opened or closed. Given this is a portable tool, there's no need to install it, hence no changes are made to your PC. The program does not require installation, but rather you can decompress the archive in any desired location on your local drives. While the tool includes a small window that features just a few options, it is suitable for the role of the application. The UI is as simple as it gets and is comprised of two main sections, namely one that allows you to add the details of your query and another that permits you to preview the results. Even though the data is clearly displayed, it would have been useful if the app would let you export or save the results. The idea behind the application is to provide you with a quick method to find out whether certain ports are opened or closed. By learning their status, you are able to make an educated decision on the next step to take to solve your connectivity issues. It is important to note that considering the dangers you are exposing yourself whenever you open ports – particularly in the firewall – the program addresses mostly advanced users. Although in theory, leaving ports open should not be a problem, it is recommended that you limit the inbound connections to the IP addresses and hence, reduce the risk of having to deal with a malware infection. In the eventuality that you are having a hard time accessing an online application due to connectivity issues, then one solution could be to open or close the corresponding TCP or UDP ports. PortChecker is an application that enables you to find out more about the status of your ports with just a few clicks.